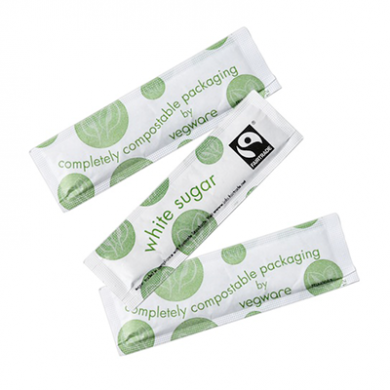 An ecological solution, white Fairtrade sugar wrapped in the first compostable wrap. Most sugar sticks use paper with an oil-based PE plastic lining. The plastic lining is there so that the package can be heat sealed, keeping the sugar contained. Vegware's sugar sticks replace the PE lining with a plant-based coating which can be heat sealed. 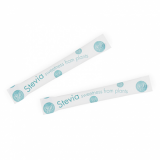 So after use, Vegware's sugar sticks can be recycled either with dry paper, or composted with food waste. Sweet!